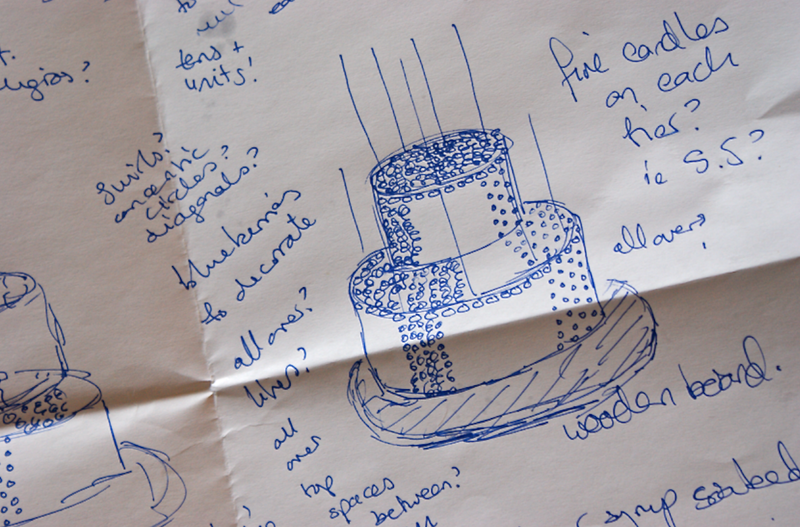 ...and so this year I needed to create a smaller cake for about 100 along the theme of blue and white. It's not an easy colour scheme for a cake, I found - it seemed far too easy to stray into wedding cake territory. I had a few ideas about blue macarons first but in the end I settled for blueberries to add the colour. I wanted to pair the blueberries with another flavour and hit on fresh ginger. 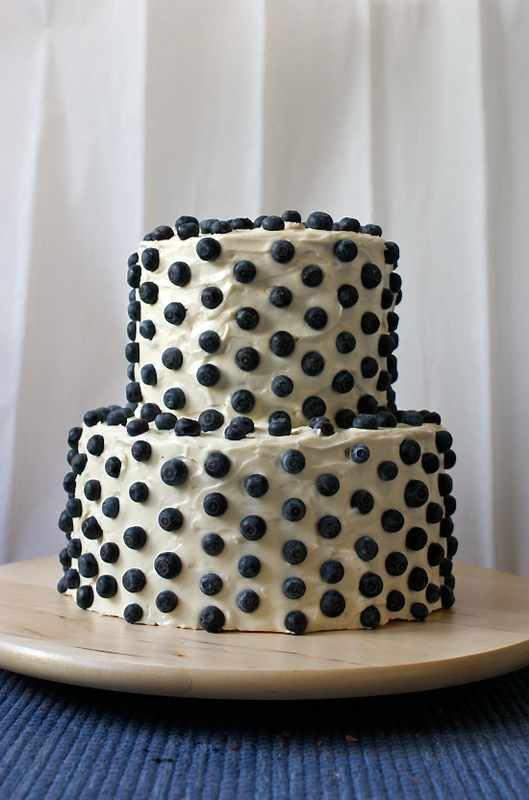 After some musing, I decided that the best way to showcase the blueberry and ginger combination was as such: fresh ginger syrup soaking the plain sponge, sandwiched together with a blueberry compote, slicked with a fresh ginger flavoured cream cheese icing and decorated with fresh blueberries. The ginger sugar syrup was one of the best things I discovered while making this cake - it truly was so delicious. I'll have to make it again. I wanted the icing to have that cream cheese tang but not be overpowering. To do this I decided to add nearly the same weight of mascarpone to even it out and add creaminess. To add the ginger flavour I made a concentrated syrup and some ground ginger to add an extra kick. I made the blueberry compote to sandwich the layers with two packets of frozen blueberries - I was surprised at how well it worked and how tasty they were. I found a new plain vanilla cake recipe in Good Food as I didn't really like the cake mixture I tried with my big Summer Fruits and White Chocolate Layer Cake. It turned out really well - I was very pleased. It was easy to put together and tasted fabulous. I didn't add the vanilla to the mix as I didn't want to add another flavour to the mix - and once it was soaked with the ginger syrup it was so tasty anyway. I was very worried I wouldn't find the blueberries in the supermarket as they don't have them everyday. Thankfully I turned up when they opened and a big crate was sitting there waiting for me. I'm not totally pleased with the arrangement of the berries - particularly the way they photograph - but it meant every slice had the right number of berries and it did look quite striking. The balance of each slice needed to be exactly right and thankfully I think I got it - the sharpness of the berries against the icing, the ginger and the blueberry compote, the right amount of cake. My mum always has great luck in whatever she does and so I'm entirely surprised that this cake turned out so well! I think it's the best thing I've made so far taste-wise. It was a lovely party and I was so glad this cake came together so well. Lots of people came up to me saying how much they had enjoyed it and that really made my night. Every crumb was eaten up before we came home, which has never happened before. I don't feel like my photos really do this one justice - I was a bit hurried to finish and get ready as I did everything on the day of the party so didn't have lots of time to play with them. 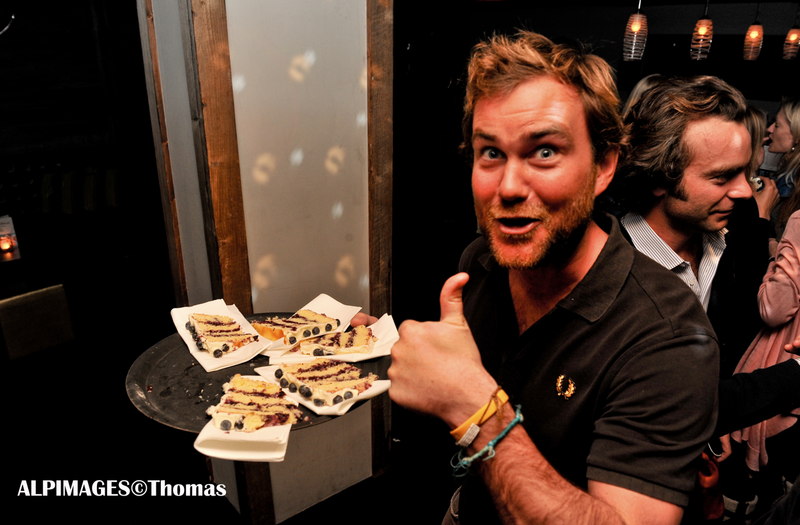 Shaggy, below, very kindly helped me with cutting the slices and handing them out. I always like getting a thumbs up for my work! For this big cake, I made 2 batches of the mix for the 10" bottom layer in two tins, then 1 mix in a tall 8" tin and a half mix in another 8" tin. This batter itself works in a single 20 cm tin or two tall smaller tins (like 7"). If making a 20 cm cake, halve the following icing etc recipes. Preheat oven to 160C/140C for fan ovens. Grease and fully line the tin. Put the butter and sugar in a mixer and cream till very pale and fluffy. Add eggs one at a time, beating well between each addition. You may need to add a tbsp or two of flour to stop it getting slimy. Fold in the yogurt. Sift the flours over the batter and fold in - when nearly done, add the milk. Spoon into a tin and bake for about 1 hour - 1 hr 20 or until risen, golden and a skewer comes out clean (when split into two, 45-50 minutes). Leave to cool on a wire rack for 15 minutes before spiking the cake all over and pouring some syrup over, letting it sink in as evenly as possible. Leave to cool completely before removing from the tin. Take the root of ginger and cut small discs from it about 3 or 4 mm thick. Put the sugar, water and ginger discs into a small sauce pan and heat gently till the sugar is dissolved. Remove to a bowl and leave to infuse and cool. Put all the ingredients into a small saucepan and over a medium heat bring to the boil and then remove - you don't want it to be mushy, so try not to stir all the time or overcook it. Transfer to a bowl and leave to cool. Cut the ginger root up into small pieces then put in a small pan with the water and caster sugar. Wait till the sugar is dissolved them bring to the boil - you want this syrup to have a much more concentrated ginger flavour than the ginger syrup to soak the cakes in. Leave to cool. Beat the butter and icing sugar together - this might be easier in a food processor as it won't come together and will be quite dusty. When the butter is evenly dispersed, add the cream cheese, mascarpone and ground ginger. Beat until smooth and increased in volume. Pour in the concentrated ginger syrup and beat again to incorporate. Put into the fridge to firm slightly. fresh blueberries (I used four small packets). Split the layers into the desired number. Sandwich them up on a board covered with four strips of baking parchment with the blueberry compote. Fix this in place with some wooden kebab sticks or similar for dowels - I used four from the top right through to the bottom. Trim as desired. 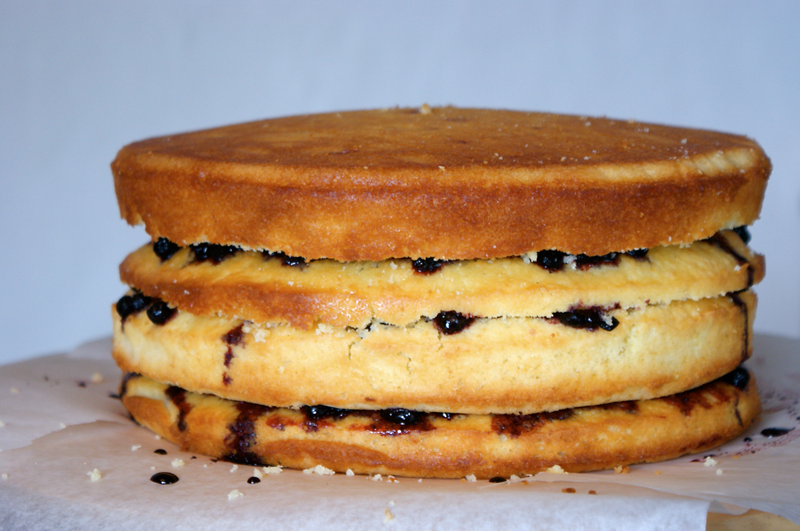 Use a palette knife to cover the cake with a crumb coat - careful with the blueberry compote coming through. Put in the fridge/a cold place for 15 mins or so to firm up slightly. 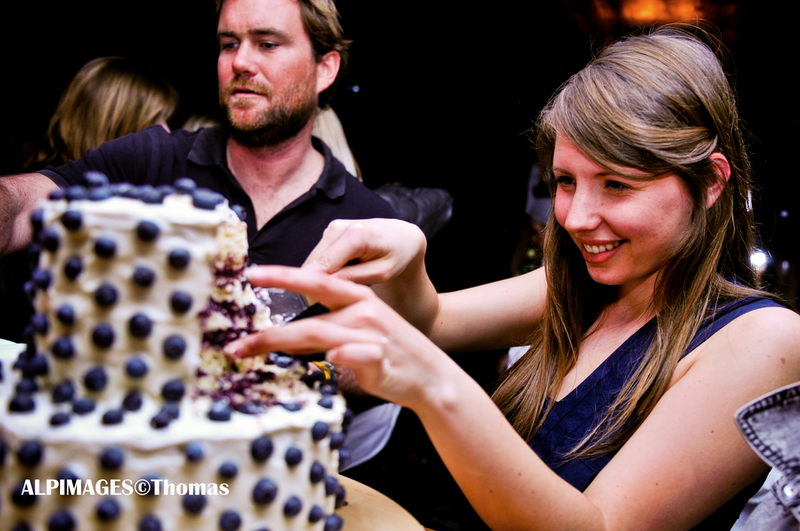 Carefully cover the cake with a thicker layer of icing, again being careful to not let the blueberry come through. Starting from the top, start placing blueberries in the desired pattern, working downwards and then around. They should stay in the icing if pushed in slightly. Remove the baking parchment and make any final touches. Put in a cool place till served (you don't want it too cold - it could be kept in the fridge and then taken out 15 mins or so before eating. This cake looks amazing! 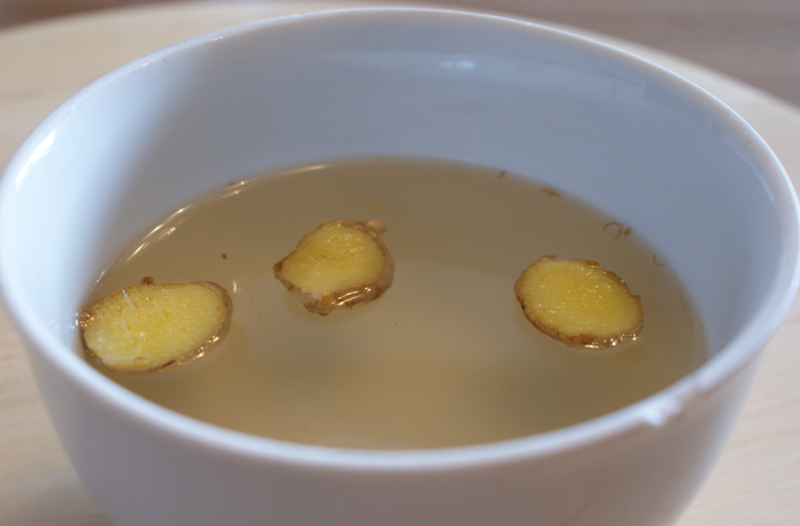 I love the idea of soaking the sponge in ginger syrup, its something I might have to try. I stumbled across your blog recently, and I love the look of all the recipes, and the amazing pictures. Can't wait for my kids to bake such a wonderful cake for me. Your mom is very lucky. The cake looks just great. It tasted absolutely wonderful. It was so special! I did feel very lucky. wow! you are amazing! the cake looks beautiful! Really adorable! It must have taken you so much time to get the blueberries all perfect. It sounds and looks really delicious too! I love cakes! Oh wow this looks great. 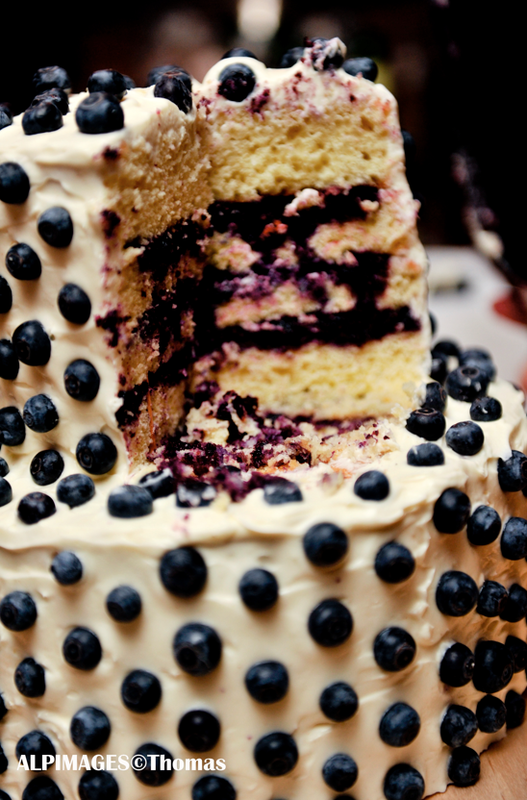 I love how you've used the blueberries on the sides of the cake. Happy Birthday to your mum! wow emma!!! I love the way you decorated and those layers look sooo good! 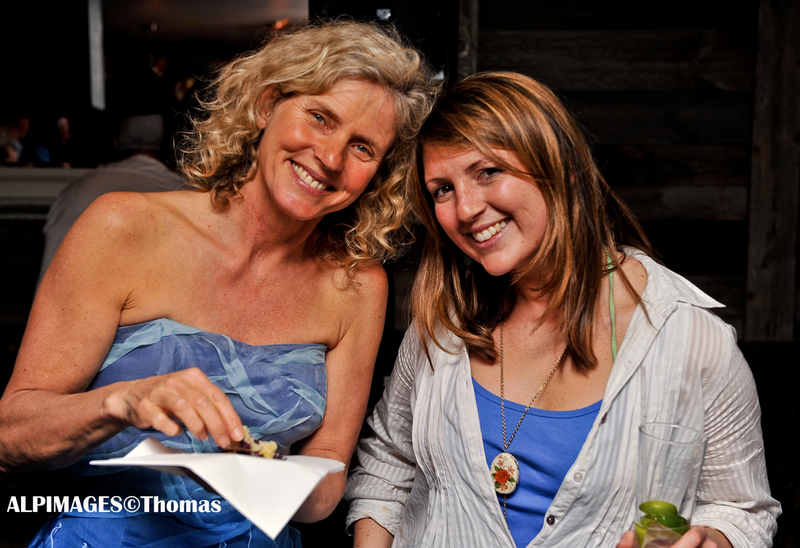 and what a crazy nice party for your mums birthday! Wow, the cake is stunning! 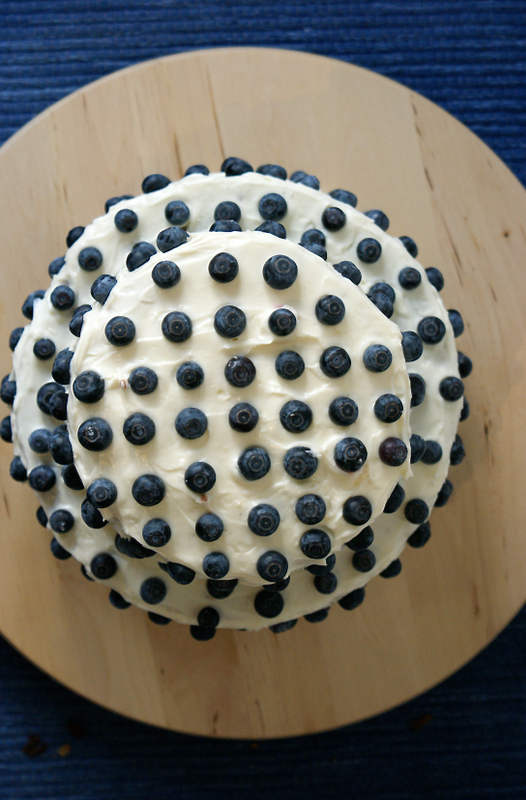 Such a great idea to combine ginger and blueberry, too. Amazingly, this cake tasted even better than all your other cakes that I have previously been lucky enough to eat. You are truly talented and I wish you luck with your gift. that is such a good looking cake !!!!! did you get any help ?? mmmm... 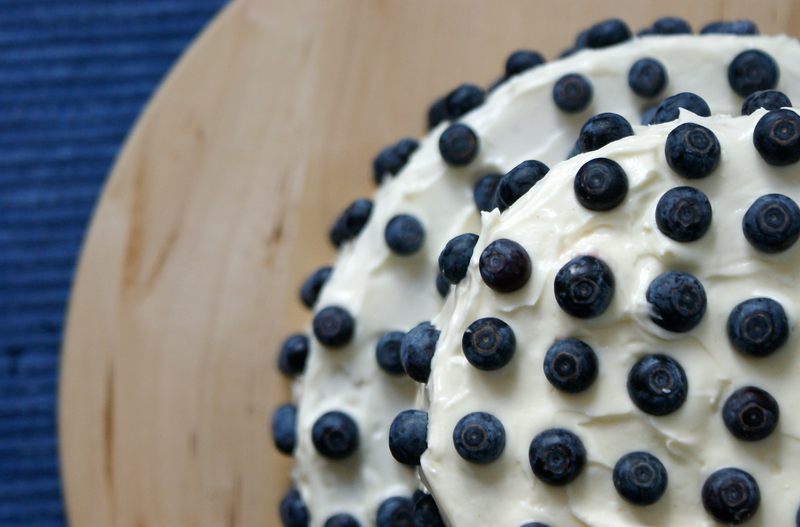 I love the combination of blueberry and ginger, and I would have never thought to make ginger cream cheese frosting! Will definitely have to try this soon. Hi! 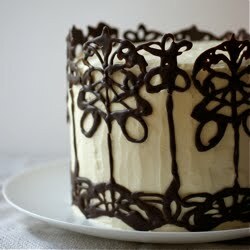 I have just found your blog via TasteSpotting and I love this cake! The decorating is amazing and funny! I must find an occasion I could bake it for. Do the icing and syrup quantities suffice for the size of cake you made (ie the whole 2 tier cake). 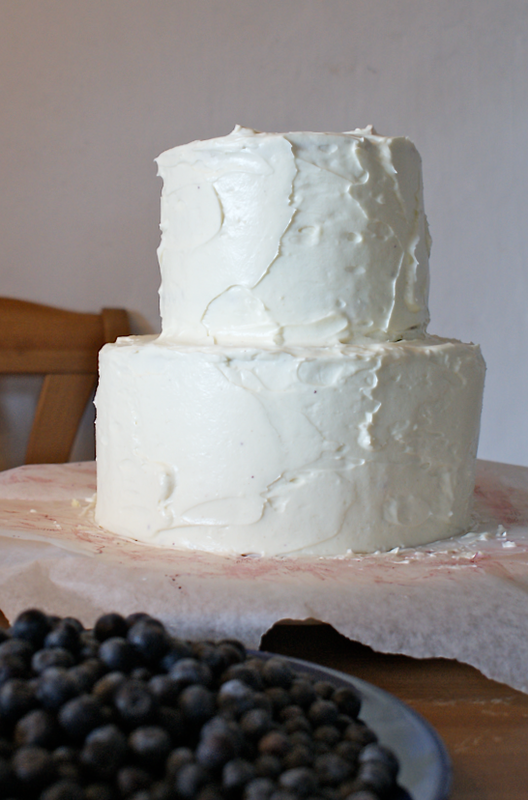 We are thinking of making the whole 2 tier cake! Anon - The icing, syrup and compote recipes are for the full two tiers. Hope it all goes well - do email and tell me! This cake looks fantastic, I have been waiting for an opportunity to make a smaller version of it, and will be doing so tomorrow! I'm just wondering what size tin to use, because I have a couple of tall 6" tins and some shallow 8". I'm worried that the 8" tins would be too shallow for the rising of the sponge. Anyway, hopefully it will work! looks absolutely amazing - so just made this for my birthday (yes, i have to bake cakes for my own birthday) - hope my friends will like it! Made this cake today for my friend's birthday party tonight. It looks great and I know it will taste as good. Will send you a picture later or tomorrow. I'm so pleased it went well - thanks for the picture on FB!